Colossus is the Hulk, the huge and strong Javelin suit powered by nothing by sheer power. Above that, the shield makes Colossus a very strong to beat an opponent. Select Colossus requires patience, it is slow due to its heavy weight, but good enough to bring any strong enemy on its knees. I called Colossus the savior, an ideal backup warrior who can pull the squad from serious troubles. To amplify its strength lets checkout some Exclusive Components, Exclusive Heavy Assault Launchers, Exclusive Ordnance, Launchers, Support Gear and Heavy. Colossus upgrades can make it stronger, all it lacks is pace and the battle in Anthem Universe demands a combination of strength and speed. Thanks to the exclusive components if you learn them like a pro you are almost unbeatable. Catalytic Overdrive: 40% boost in ability damage for 20 seconds once you trigger a combo. Emblem of Destruction: Massive 3,300% boost in Ultimate Recharge rate after you get five or more Ultimate multi-kills. Grand Entrance: Explosion around Colossus after hand-landing on the ground from a height without slowing. We will update the section as soon as we get more updates on the exclusive gear for the Javelin Suit. Till the time you can read our some extremely useful tips on the Javelin Suit – Colossus. 1). 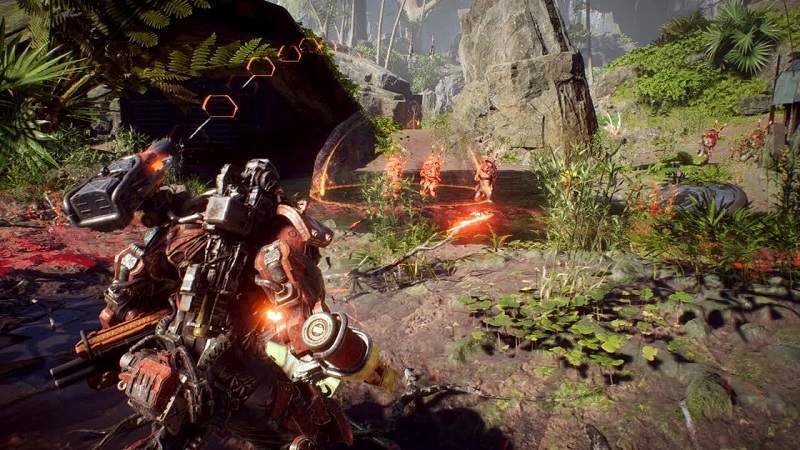 Backup: Colossus can be the best protector in Anthem, it can offer his squad member a plus point to penetrate easily in enemy’s territory or bring down a big boss while Colossus is in attack mode. Remember Colossus lacks dodging skills, also the shield is an added advantage but use it strategically. 2). Shield: Colossus shield cannot handle much damage, too much stress and you will be stunned. That’s the reason a lot of player dies as they barge into a group of enemies by covering them behind the shield. Colossus strength amplifies on the basis of gear you choose, so it is essential to pick the best combination. 3). Stay on Ground: Avoid Colossus attacks in the air, the Javelin suit is stronger on the ground. Use rocket boost and flight to avoid obstacles, try saving your rocket fuel and use it as an escape point when you are heavily under attack. Use melee shield attacks to slam a strong enemy, this works well most of the time, and also you get one hit kill. 4). Heavy Weapons: Colossus features heavy weapons, so use them to create an impact, like the grenade launcher. You can damage multiple enemies in one shot leaving enough windows for your squad to do the rest. Minigun is another heavy weapon Colossus can carry and it is amazing to kill or reduce the health of a group. 5). Nuclear Attack: For bosses, Colossus can strike with a nuclear missile, there are three shots available so don’t use them when not required. The ultimate ability also unleashes high damage, learn to position yourself when you are about to trigger the Ultimate. Avoid wasting it at all cost. Note: This guide is still work in progress. Stay tuned for the Masterwork and Legendary Gears for Colossus Javelin.